Monday 11th February – Australian Market Wraparooney! | Beeks Downunder-Because not all financial news is boring! Monday 11th February – Australian Market Wraparooney! A soft start to the week but off its lows as China resumes trading with iron ore miners the stars. The ASX finished down a modest 11 points at 6061 after a closing rally. Banks weighed as profit taking again hurt the sector combined with the results from Bendigo and Adelaide (BEN). CSL fell in a hole as did TLS ahead of results later this week. Infrastructure stocks in demand but big miners were the stand out again. BHP, RIO and FMG leading the sector higher as Dalian iron ore opened limit up. Results from JBH, BEN, AZJ and PPS were mixed. AUD stable around 70.92c. ASX 200 starts the week with more profit taking knocking 11 points off to 6059. High 6085 Low 6029. Closing rally helps. Aged care commission starts up again. Results mixed but JBH cheers. Banks turn soggy after BEN results. Iron ore miners the bright spot as Dalian futures limit up. Gold producers back in demand. AUD steadies as China returns 70.92c. REG +6.29% EHE +7.30% aged care rallies as RC starts. AAC -12.26% Queensland cattle update on floods. JMS +7.27% dividend announcement from Tshipi. FMG +3.48% iron ore price rises. SKI -6.37% tax ruling goes against forcing less to distribute. PPS -15.71% dog gets no better. GXL -0.18% court approves scheme. COE +1.01% loss doubles. Production 1 15%. SOL the focus. KGN -4.76% ceasing to be a substantial shareholder. GRR +4.00% iron ore price rises. MIN +2.50% lithium and iron a heady combo. BID +3.80% buyers moving in post presentation. Speculative stock of the day: Fenix Resources +18.18% on big volume following high-grade iron ore extensions at Iron Ridge including 58.2m @66.6% Fe from 79m. Sigma Healthcare (SIG) +5.36% has completed a review of operations. EBIT FY19 guidance of $75m confirmed. The outlook points to a 10% pa growth forecast for FY21-FY23. FY 20 EBITDA of $55m-60m. Bendigo and Adelaide (BEN) -6.82% Statutory NPAT $203.2M vs year-ago $231.7M EPS 45c, (up 3.6%) y/y . Net interest income $656.5M vs year-ago Net interest margin 2.35% vs year-ago 2.36% Common Equity Tier 1 ratio 8.76% vs year-ago 8.61%. Dividend is unchanged at 35c. JB Hifi (JBH) +1.51% The results included guidance of $237 million to $245m compared to consensus of $239 million. Return on equity of 24%, PE of 11.0x, yield of 8.5%, trading 30% below intrinsic value, Macquarie has a $29 target price (25% above the current share price), now de-risked for 3 to 6 months thanks to results, and is in uptrend and as the third most shorted stock in the market the shorts are being squeezed. It is still 19% below its year high. Amcor (AMC) +1.89% Packaging giant has reported first-half profit of $328.5m, ahead of forecasts of $320.2m. Revenue was a slight miss, coming in at $4.55bn vs $4.56bn expected. The dividend will be 21.5c, up from 21c a year ago. The company reiterated guidance which it stated in August; Rigid Plastics segment is expected to deliver solid underlying PBIT growth in the 2018/19 financial year. Aurizon Holdings (AZJ) +0.23% Half year results. Underlying NPAT came in above consensus at $227m, revenue and underlying EBIT fell just short of expectations at $1.46bn and $406m respectively. Full year guidance maintained. GPT Group (GPT) +0.16% GPT’s continued foray into the logistics sector appears to be paying dividends. Full-year net profit came in at $1.45bn, up from $1.27bn a year ago. Net tangible assets came in at $5.58 per security, up from $5.04 at 31-Dec-17. Guidance is for funds from operations growth, and distribution per security growth of 4% each. Australian Agricultural Co (AAC) -12.26% has notified the market that four properties have been severely impacted by Queensland floods. The impact on the company’s financial earnings for the 2019 financial year (ending March 2019) is expected to be material. Wondoola station has been most affected and its current herd of approximately 30,000 head of mainly composite cows and their calves is expected to sustain extreme losses. Current conditions remain challenging. Incitec Pivot (IPL) –2.07% An update on the extreme weather events in Queensland. The impact will be from the rail closure with an EBIT loss of around $10m a week from February 9th until the resumption of full production. The IPL Phosphate Hill facility is undamaged. The Townsville fertiliser and distribution facilities suffered minor damage. Westpac and Macquarie Bank are cutting rates for some new borrowers by up to 40bps to attract new business. At the same time rates are rising for other fixed rate loans. Getting complicated out there but competition is strong. 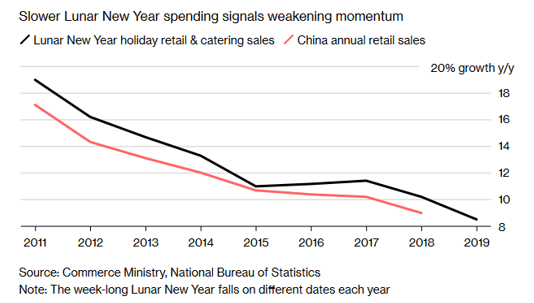 Chinese New Year spending was the slowest in years. People in China spent 1.01 trillion yuan (US$149 billion) at restaurants, shopping malls and online outlets over the week-long holiday, according to the Ministry of Commerce. That was 8.5% higher than during last year’s festive period, but the slowest increase since at least 2011. Spending at tourist venues rose 8.2% to 513.9bn yuan. Domestic box office revenue was 1% higher than in 2018. Chinese growth expected to fall to 6% in the first quarter for the lowest rise ever. Brexit minus 46 and counting. Ships are now leaving Asia with goods and have no idea what customs regime they are sending goods into. Chaos will ensue. US talks to prevent another shutdown are going nowhere. Russia bonds are now investment grade according to three of the major ratings agencies. In Hungary, a mother that has four children pays no tax. Ever. This is a move to stimulate population growth without immigration. Analysts have forecast that Germany could lose 100,000 jobs if there is no Brexit deal. 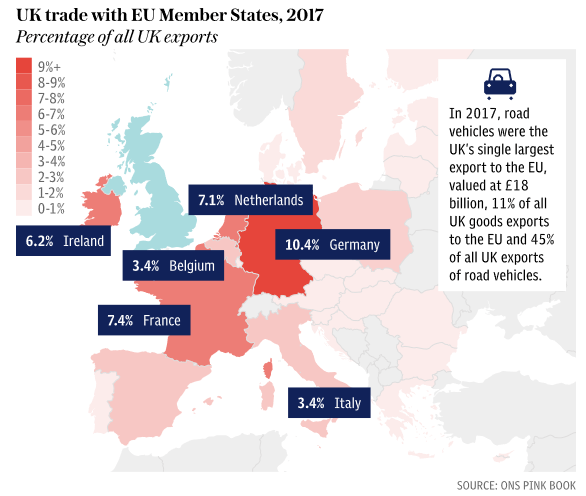 Germany sold 770,000 vehicles to the UK in 2017.